It's no surprise that with the 70's playing a major role in this season's fashion, that the wedge is a must have this summer. They look great with everything from jeans to dresses, and even pair perfectly with your swimsuits. The Chloé wedge is this season's most coveted, but don't worry, there are plenty of cute and affordable options to choose from. I've rounded up my top nine choices from designer to steel to help you find that perfect pair! I personally own these Stuart Weitzman wedges, and love their classic style. The next pair that I'll add to my closet are this Sole Society wedges. How cute are they? Tell me, what's your favorite wedge? Yes yes yes to wedges & platform sandals for summer. They give you height but are so comfortable - I'm a fan! I love all the espadrille wedges out right now!! I am so glad I snagged the Marc Fisher option while it was available. I have the Sole Society one too, and between them both it's all I need for summer! Great picks Rachel! I want 1 & 7 most! Amazing collection for this summer! 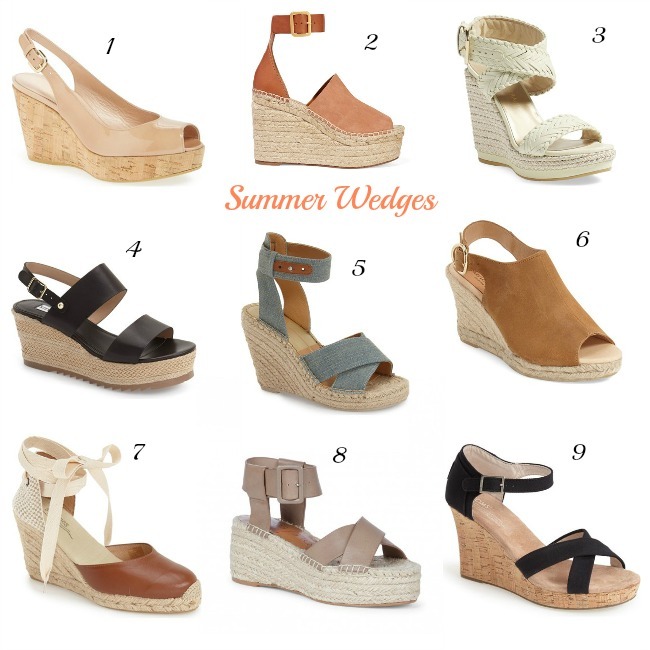 Love all of these wedges! Especially #5! I love number 2! awesome summer picks!